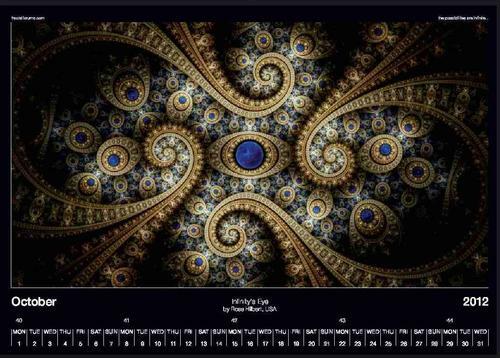 Why is it the best fractal calendar ever? As you can see, I’m excited about this one. After all those years of the sickly (leprous!) 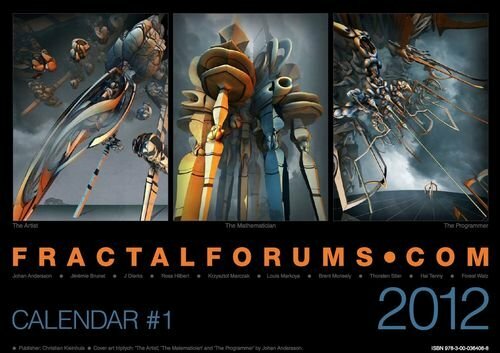 Fractal Universe Calendar that “featured” cliche flowery spirals and was an annual embarrassment to the fractal art world, this Fractalforums.com 2012 Calendar is a sign that better things are truly possible in the fractal art world. Christian Kleinhuis, 35; Working as Web-Programmer in Cologne,Germany, living in Bonn. Working with fractals and knowing about the theory behind it has inspired me, like most of us at the Fractalforums from a programming background. I started my first mandelbrot in the year of 1990 in amiga basic. My goal back then was to create a comfortable zoom tool to enable zooming into transforming fractals. This was the time my first mutatorkammer was developed –a generic formula creator for iterative formulas. I really don’t know if it was done earlier, but I found it out on my own. I was using hybrid formulas, mainly alternative forms of hybrid formulas, where formulas (or just the parameters) are exchanged in each iteration step. 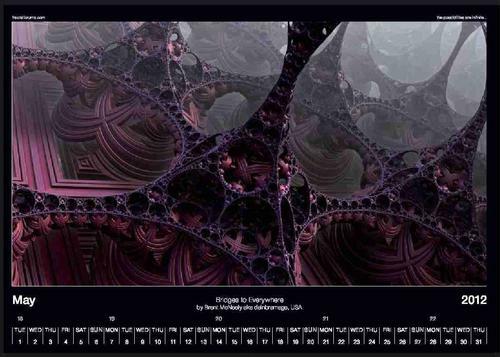 Ultrafractal has always been a source of inspiration, and THE database for fractal formulas, especially coloring algorithms. Ultrafractal then developed the animation functionality, and I saw that it was perfect, and that my style of code (rather show that its working,and not make a usable program) wouldn’t lead to such great usability … this was then around 2006, when the Fractalforums.com was founded by “Jason Henegan”. 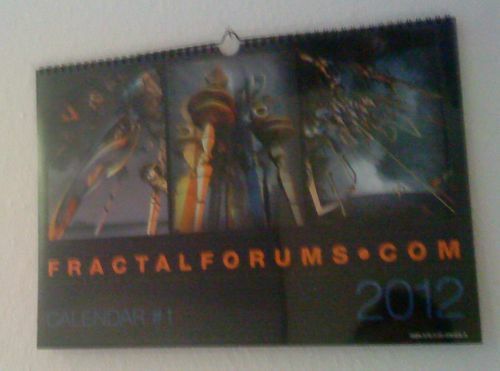 The idea for the calendar came to Christian around Spring of this year, 2011, while he was considering ways of defraying the costs of hosting the forum. He alone was covering the cost of the forum’s expenses. 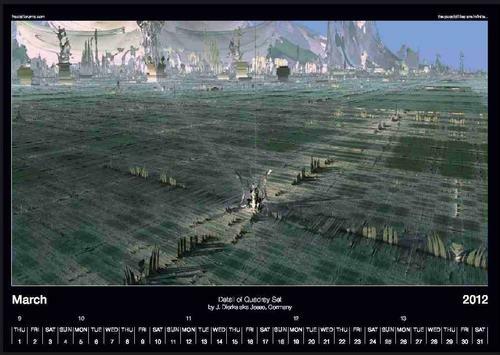 A change of hosts and increased advertising revenue improved the financial situation for the forum but he still wanted to produce a calendar and thought it was good idea for the forum in other ways. In the Fall he put up a poll on the forum to find out what interest members might have in buying a calendar. The response was encouraging enough so he made plans for selecting the images and finding a publisher. 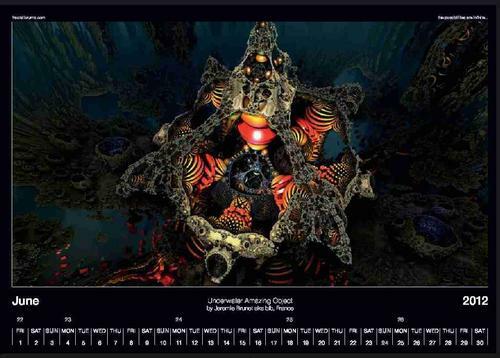 One of the images is a winner in the Benoit Mandelbrot Fractal Art Contest 2011. Three others are variations of winning entries in the BMFAC 2011 by the same authors and reflect the sort of “multiple venue” selection I mentioned at the beginning. All of them will be familiar to those who frequent Deviant Art’s fractal pages. 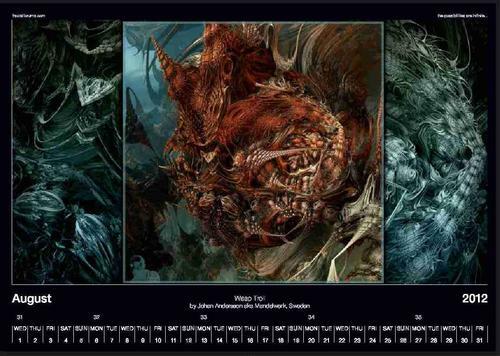 In my opinion, all the images are good ones and while there are maybe one or two that I’m not as excited about, there aren’t any mediocre ones and there aren’t any that resemble the sort of junk the Fractal Universe Calendar used to cough out year after year. Louis’ winning BMFAC 2011 entry was a variation on this theme. 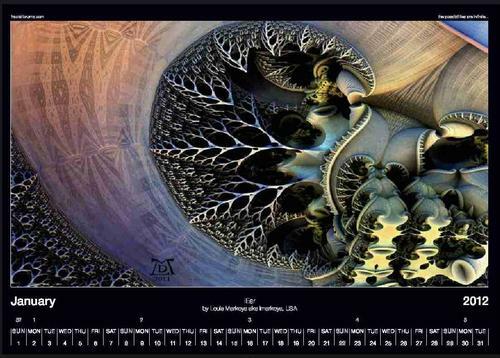 In case you don’t know, Mr. Markoya is a newcomer to the world of fractal art –just this year in fact– but he’s a long time member of the larger art world and even collaborated with the great Salvador Dali back in the 1970s. It’s his program so he can put a shiny monolith in it if he wants to. Krzysztof Marczak is the author of Mandelbulber, one of the popular 3D fractal programs that grew up around Fractalforums.com. He’s quite accomplished with the program’s fine art of embedding objects. One of my own all-time favorites. The thumbnail doesn’t do justice to the full size image. Like Krzysztof, Jesse Dierks wrote the program his images are made on. 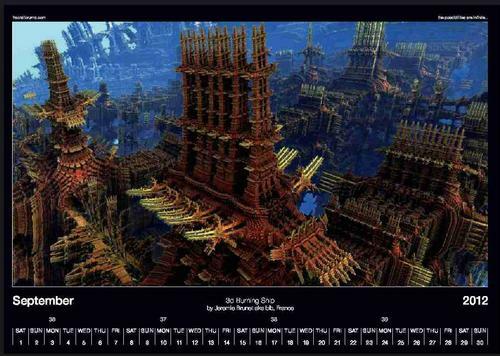 You see how much talent there is on Fractalforums.com? Jeremie needs less introduction than most 3D fractal artists do. He’s had at least two shows of his artwork in Paris (France), a spot on a French TV art channel, and probably a few other things even I don’t know about. Brent is better known online as “Dainbramage” although he has yet to show any signs of permanent mental impairment. Here’s a good example of those complex fractal forests that exhibit squares, circles and just about everything in between; an Eiffel Tower Forest. What? Two images by the same artist? This is Jeremie’s winning entry in the BMFAC 2011 where their (unwritten) rules state that an artist can only truly have one good image a year. Everyone loves this one and evidently Mr Kleinhuis does too. 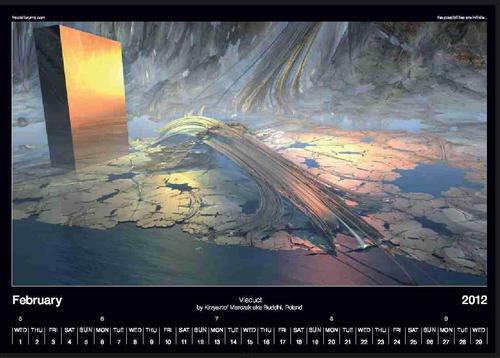 Torsten, known also as “taurus66” is a dedicated explorer of the 3d fractal interiors. He’s also one of the few artists who dares to be colorful and does a good job of it. He’s not afraid to use lake effect either, although he hasn’t in this one. Another widely popular image and a variation of a BMFAC 2011 winning entry. This was a monthly winner as chosen by the Fractalforums.com membership voting and won a few other awards elsewhere. The whole world seems to love Johan’s Wasp Troll series of images. I find them a little scary. Three images? Ay caramba! Hey, it’s all about art, not about artists. Jeremie is always pushing the envelope of the Mandelbox and if the calendar could accommodate animation then his amazing vidoes would take up at least half the spots. Maybe living in Paris just gives artists a little edge? Ross is another artist who has also created the machinery he works with. I’m guessing, but I think this one was made with his Fractal Science Kit. 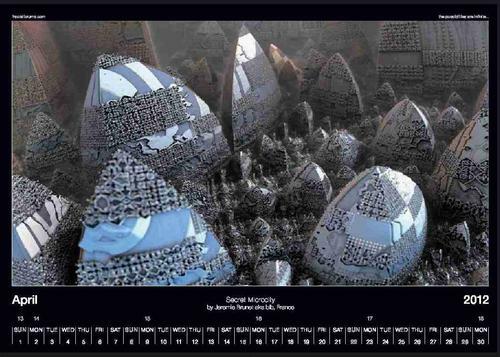 If you hang out at Fractalforums.com you will have seen many other richly detailed geometric artworks made by him. He’s another “pillar” of the Fractalforums.com community. If you’ve seen anything this year in the world of 3D fractals you’ve seen some of these bronze metalworks. Hal Tenny makes the best ones and I think he also made either the original ones or at least gave them their incredible popularity. He had a winning entry at the BMFAC 2011 that was a variation of this. Everyone finds these things cool to look at. It’s hard to believe they’re not photographs, the surface texture and lighting is so realistic. A fine choice for a Winter month. 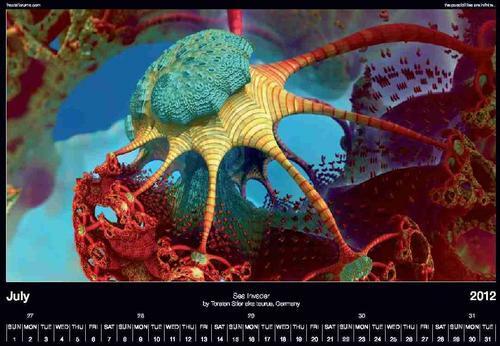 The small image here doesn’t quite show the wide range of shapes and crystalline details in this fractal “beest”. It’s not the easiest thing to find this sort of dragon-like image and present it in such a pleasing way. Fractal art can be a real challenge sometimes because it’s pretty easy to make and that makes it hard to create something that stands out so well as this. Well, there you have it. What a great event to finish off the year with. 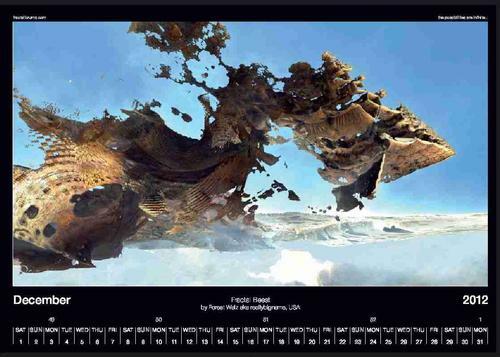 Hopefully the calendar will sell well and this Fractalforums.com 2012 Calendar will become the first edition of an annual event. Christian Kleinhuis and the forum voters have made a great selection. The extra large size the calendar has been printed in along with the spiral binding ought to make for a long-lasting tribute to how great the early days of 3D fractals on Fractalforums.com has been. 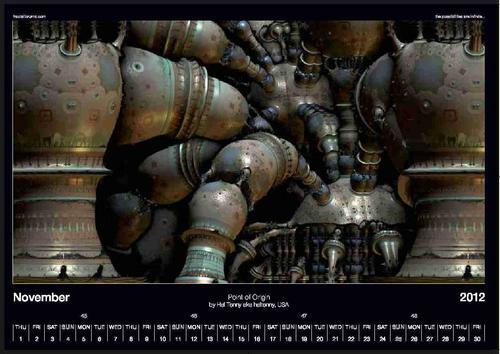 Why not grab a piece of fractal art history and buy one? 3. travelling highway – the coder of one of the programs needed to be inside, funny thing is that it is in fact more of a test rendering, to test his program interact with euclidean geometry …. 7. exploring the sea -(more of a secret ) if one of the images could be a problem it is this one, and should better have been exchanged with a better one …. first it won the annual compo, and the bfmac, and thus i felt like i had to use it, but it is in fact cropped far more as it would be good, and additionally the background of this image comes out very dark…. but c’est la vie! 8. summer jellyfish – this image always blows me away when i see it, love the colors and structure, and i am happy to push taurus into creating a 16:9 version out of his original 4:3 one …. 11. 2d cut – infinites eye – i wanted to honor ross for his extraordinary sharp and clean usage of ifs renderings, beside of that this image won the annual 2d compo …. 13 up up and away – the journey continues, with this striking image ….